If you are a newcomer, it is recommended that you read the previous post about Go - Arrays with Code Examples to fully understand Slices. 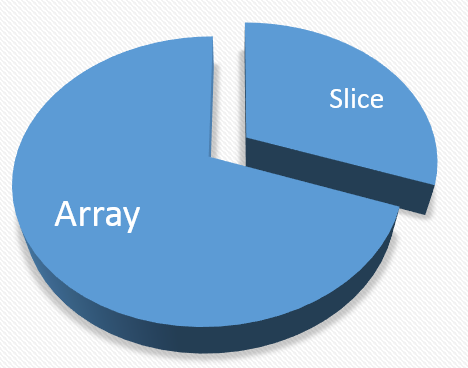 The length of a slice may be changed as long as it still fits within the limits of the underlying array. 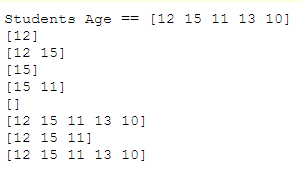 The above line of code declares a slice variable named studentAge. How's it different from a simple Array? Did you notice the missing length between the brackets? Yes, that's the only difference in terms of declaration. You can visit this post about Simple Go Arrays to see how we declared an Array. The above statement creates a Slice with an initial length of 5 that is part of an underlying array of capacity (maximum length) 5. 0 is starting index from where we'll START slicing. Try and execute the following code to fully understand what we mean by reslicing. Play here. Hope the above makes sense. Please add your comment to let me know if I missed something in the description. Let us make these tutorials Go newcomer friendly. In the next post we'll learn about Adding Elements to a Slice.